due to interventions made by KVK through large scale demonstrations under National Horticulture Mission and also KVKs FLD and assessment. Under the NHM use of skirting bags were organized for 50 farmers in Newasa Rahuri and Rahata tehsils. The use of skirting bags has enhanced the quality of harvested fruits and have provided 11 per cent higher yield due to KVK’s intervention. The farmers are cultivating banana in medium to heavy soils. The crop is known to be affected seriously with poor bunch weight and quality and diseases like sigatoka blight, and pests like red rust thrips causing heavy economic losses to an extent of 25 to 30%. The farmers were organized from three Farmer Clubs in Rajuri, Mamdapur for a training on improving the bunch quality and prevent the damage due to red rust thrips. Apart from this several training programmes were organized in Newasa tehsil for the benefit of banana growers. They were convinced regarding the increasing cost of pesticides and nutritional problems in banana and about the need for use of covering bags for bunches. It was later proposed to undertake an assessment of use of covering bags to alleviate the disease and thrips problem and apply balanced nutrition based on leaf testing. 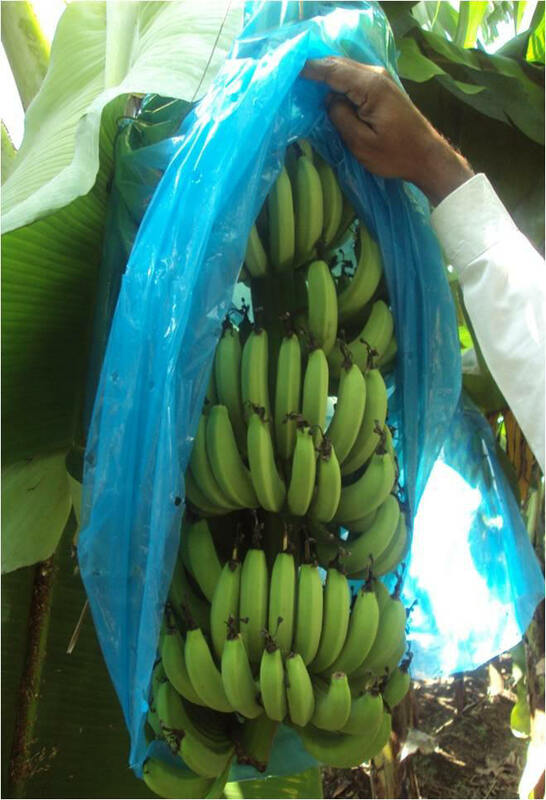 It was the the first instance where the KVK took the use of skirting bag usage in banana to farmers on a large scale. Along with the technology of skirting bag use the farmers were also provided technical backup on use of leaf test based nutrition. The KVK provided the fertigation schedules as well as other nutrition diagnosis for remedy of several maladies. Today the fertigation of banana as well as the use of banana bunch nutrition using potassium foliar sprays has spread to almost 80 per cent banana plantation in Shrirampur, Newasa, Rahata and Rahuri tehsils. There is an estimated area of over 600 ha out of which 480 ha is presently being served by KVK directly as well as indirectly through linkage with line department.